Certain countries in the West have already begun their rounds with lavish and expert funding for a regime change. Knowing only too well that it would be hard to challenge the popularity of President Mahinda Rajapaksa, certain elements in the West have resorted to various other tactics. Surveys by three Western missions here have disclosed that President Rajapaksa would easily win the next Presidential election which is likely to be held next year. Greatly disturbed by the outcome of their surveys, these missions are now adopting various tactics. Ever since the plans for an early Presidential election were speculated in political circles, lavish funding has filled the coffers of certain NGOs which are notorious for sinister anti-Government and anti-Sri Lanka campaigns. Making the best use of these NGO goons who are greedy for money, certain INGOs are spearheading these campaigns under the direction of certain Western missions in Colombo. Meanwhile, Kalutara District UNP parliamentarian Palitha Thewarapperuma has evaded a Western trap by putting country before self. The MP was in the news after he was assaulted by unruly mobs during recent unfortunate incidents in Aluthgama and Beruwala. The US Ambassador in Sri Lanka Michele J. Sison showed her unbelievable concern for Opposition parliamentarians in Sri Lanka when she called Thewarapperuma last week. A surprise call from the US Embassy in Colombo made Thewarapperuma to think twice. Ambassador Sison came on line and requested a one-to-one meeting with the MP on Thursday. Before meeting the US Ambassador, Palitha Thewarapperuma consulted his party leader – Opposition leader Ranil Wickremesinghe. While giving the green light, Ranil cautioned how he should face the meeting. MP Thewarapperuma knew exactly what was on store though he responded to her request. “It wasn’t a communal problem between the Sinhalese and Muslims. It was a job of extremist looters. That was clear though some try to project it as communal riots,” he said, much to the disappointment by the US Ambassador. It was obvious that all questions fired by Ambassador Sison were pointed at one particular target and to use the MP’s evidence to paint a dismal picture of the country. Despite being an Opposition MP, Thewarapperuma did not wish to play the role of a traitor by betraying the motherland. “Did you intervene because there was a political problem?,” was Sison’s second question. “There was no political problem at all. I intervened to protect people. The Sinhalese and Muslims in the area have voted for me. I went there to assist those people,” the MP replied. 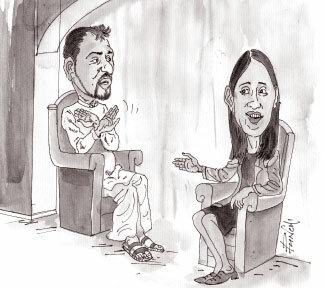 “Is there a threat to your life?” she asked but Thewarapperuma replied in the negative and said that he is safe in the country. “In case you encounter problems and face life threats, please speak to us. We will take care of you,” Sison promised. At the same time, she has asked certain other questions to ascertain the possibility of the MP joining Government ranks, which was none of her business. “Will you quit the UNP?” she asked. “Never! I created a name for myself in politics through the UNP. Hence, I would never desert the party and crossover to another political party,” he replied. She had even inquired whether the MP faced threats from the Government but Thewarapperuma said “no” firmly. But Sison offered political asylum to Thewarapperuma in case he faces threats in the future. Ambassador Sision has said that the US will welcome all efforts made by Sri Lankan politicians to change the negative image that had been created in the minds of international community that the majority Sinhalese were harassing the minorities. The UNP MP informed the US envoy that nearly 26 houses of Sinhalese had also been damaged in the clashes. Thewarapperuma told Sison that over 95 percent of the Sinhalese reject extremism and only a handful were engaged in extremist acts. Opposition Leader Ranil Wickremesinghe last week admitted that the then UNP government did not take adequate action to prevent racial riots in July 1983. “There were shortcomings on the part of the UNP government of 1983 as it did not take adequate action to prevent Black July 1983 and the same mistake should not be repeated,” he said addressing a meeting of religious leaders and heads of civil society at the parliamentary complex last week. Ranil said the issues between the Sinhalese and the Muslims should be ended though discussion and that the government should provide adequate security. But the fact that Ranil had conveniently forgotten was that he too had been a powerful Cabinet Minister during that Jayewardene regime and held collective responsibility. The Most Venerable Girambe Ananda Anunayaka Thera, who also addressed the meeting, stressed the need for the preservation of peace and goodwill between the Muslims and the Sinhalese. The Venerable Thinyawala Palitha Thera highlighted the fact that the Sinhalese and the Muslims suffered as a result of the clashes created by some interested groups. Politicians often use arrests and remanding as blessings in disguise to get petty political mileage. Especially the bankrupt politicians who have no takers think that they could resurrect their political careers if they get arrested so that they could show the handcuffs to television cameras and get undue political mileage. UNP MP Ajith P. Perera said that the government should arrest Samaraweera if he had divulged State secrets or made a false statement with regard to recent incidents in Aluthgama and Beruwela. “There is no point in accusing Samaraweera. If he had made a false statement or divulged State secrets, he should have been arrested,” Perera was quoted as saying. He said Mangala had not divulged any State secrets as he had only named a few officers attached to the defense fraternity and intelligence. Perera said that everyone, who had followed current affairs, is aware that the persons whose names were mentioned by his colleague were involved in the defence sector. At a recent media conference, Mangala alleged that some officers whom he named were involved in the recent clashes in Aluthgama and Beruwela. Perera had contradicted his own statement. While claiming that Mangala had not divulged any State secrets, he has openly admitted that the Matara District MP had named a few officers attached to the defense fraternity and intelligence services. Isn’t that a betrayal of the Security Forces and divulging of State intelligence secrets? President Mahinda Rajapaksa is due to complete his four-day state visit to the Maldives and Seychelles today. The President arrived in Ibrahim Nasir International Airport in Male in Wednesday evening, along with First Lady Shiranthi Wickremasinghe Rajapaksa, on the first leg of his State visit. Maldivian President Abdulla Yameen Abdul Gayoom and First Lady Fathimath Ibrahim warmly welcomed President Rajapaksa and the First Lady. President Rajapaksa was accorded a 21-gun salute by the National Defence Force of the Maldives. The national anthems of Sri Lanka and the Maldives were played followed by a guard of honour. The welcoming ceremony comprised of cultural items performed by students. President Rajapaksa and the delegation then proceeded to the President’s Office in Male with a cultural procession which attracted the Sri Lankan leader. During his stay in the Maldives, President Rajapaksa held bilateral discussions with the Maldivian President and also called on former President of Maldives Maumoon Abdul Gayoom. Official discussions between the two countries were also held after which Sri Lanka and the Maldives signed bilateral agreements on health and investment. The Maldivian President hosted a state banquet in honour of the visiting Sri Lankan leader. On the second leg of his state visit, President Rajapaksa accompanied by First Lady Shiranthi Rajapaksa, arrived at the Pointe la Rue International Airport on Friday afternoon.The President was received at the airport by Seychelles President James A. Michel, Vice President Danny Faure, Sri Lankan envoy for Seychelles Rajatha Piyathissa and Seychelles Consul General Errol Fonseka. The President held bilateral talks with his Seychelles counterpart yesterday. The two countries entered into a number of agreements. President Rajapaksa also opened the new Sri Lankan Embassy in Victoria today. External Affairs Minister Prof. G.L. Peiris, Higher Education Minister S.B. Dissanayake, External Affairs Ministry Monitoring MP Sajin Vass Gunawardena, Parliamentarians A.H.M. Azwer, Udith Lokubandara, Lohan Ratwatte, Ranjith de Soysa, Tenuka Vidanagamage and Secretary to the President Lalith Weeratunga accompanied the President. All former Executive Presidents, sans one lady, had exemplary retirements without making any political comments during their successors’ periods. Even when the things were going out of control during the tenure of President R. Premadasa, his predecessor J.R. Jayewardene, with all he immense political experience, did not utter a word. JR let Premadasa handle things his own way and refrained from meddling in State affairs as a retired President. But former President Chandrika Bandaranaike Kumaratunga is notorious for making political remarks often, though hardly anyone takes her seriously. Issuing a statement on the incidents in Aluthgama, Chandrika had said the law enforcement authorities had failed to deal with the situation. Chandrika had said she was appalled by initial reports that the violence was orchestrated after a public meeting and a provocative march by violent extremists who pursued narrow, personal goals, in the name of Buddhism. Though Chandrika is now shedding crocodile tears, it is fresh in people’s minds how thousands of Security Forces personnel had perished overnight due to the inefficiency of her regime. Several Army camps were overrun by the LTTE within hours, taking the lives of thousands of brave soldiers. Galle High Court Judge, K.B.K. Hirimburegama on Thursday issued a writ order, revoking the decision taken by Southern Province Chief Minister Shan Wijaya Lal de Silva to remove former Galle Mayor Methsiri de Silva from his position and council membership. The High Court Judge issued the writ order after considering the petition submitted by the ousted mayor of Galle Municipal Council Methsiri de Silva. The petitioner sought a court order to revoke the gazette notification of January 19, 2013 issued by the Chief Minister removing him from the mayoralty and the membership of the Galle Municipal Council. Delivering the judgement, Justice Hirimburegama said the chief minister had no authority to remove a municipal member on charges of misdeeds committed during the tenure of a previous council and when a new council is established after an election. Chief Minister Shan Vijaya Lal De Silva, former Southern province local government commissioner Darshaka Pandikorala. Southern Local government commissioner Chandima Muhandiramge, Dileke Kuddachchi assistant L.G. Commissioner, Kelum Senevirathne (deputy mayor), M. Niyas – former deputy mayor, Pushparani Edirisinghe- Municipal Commissioner, M. Amarasena de Silva retired judicial officer, H.P. Piyadasa chief investigation officer, investigation officers W.N. Rathana , Anusha Chandani W.M. Manjula Perera,, Galle Municipality and the secretary UPFA Susil Prema Jayantha were the respondents. Attorneys Mahesh Madawala, Manoja Guruge and Anusha Liyanage appeared for the petitioner instructed by Attorney Thushara Silva. Attorneys Sanjaya Kodithuwakku and Sanath Wijewardena appeared for the respondents with a panel of lawyers. Maldivian President Abdulla Yameen Abdul Gayoom has said that Maldives doesn’t approve external pressure over countries and said that was why the Maldives consistently stood for Sri Lanka at international fora. “Our two countries have been very good neighbors for a long time. We do not approve undue external pressure over countries. That is why the Maldives consistently stood by Sri Lanka at international fora. We will continue to do so shoulder to shoulder with Sri Lanka,” the Maldivian President said during a bilateral discussion with President Mahinda Rajapaksa at President’s Office in Malé last week. While noting that President Rajapaksa had visited the Maldives on four previous occasions, President Abdul Gayoom expressed his gratitude for the support Sri Lanka extended to his country. President Gayoom said the Maldives intends to negotiate with member countries to empower SAARC more. He called for Sri Lanka’s support to his country for the membership at the UN Human Rights Council. The government, on the instructions of the President, has allocated Rs. 200 million to reconstruct the properties and business establishments damaged during the clashes in Aluthgama and Beruwala. Resettlement Minister Gunarathna Weerakoon said speedy measures are being taken to reconstruct the damaged property in the two towns and the government has allocated Rs. 200 million for this. “Out of the allocated funds, Rs. 150 million will be handed over to the Army as the Army is entrusted with the rebuilding. The remaining Rs. 50 million will be given to the Kalutara District Secretary,” he said. President Rajapaksa who visited the area on June 18 soon after his return from Bolivia, directed Army Commander Lt. Gen. Daya Ratnayake to take proper stock of all property damage as soon as possible and launch a mechanism to get all the repairs done at state expense using the skills of Tri-Service personnel. Meanwhile, the Army began rebuilding the damaged buildings in Aluthgama on Friday. Around 800 soldiers commenced rebuilding the damaged and destroyed properties in the Aluthgama, Beruwala and Dharga Town, according to Military Spokesman Brig. Ruwan Wanigasooriya. Politicians of the Government ranks as well as in the Opposition has something in common to celebrate last week after Sri Lanka cricket team registered its first-ever Test series win in England. They won the decisive second Test at Headingly off the penultimate ball on Tuesday. On Wednesday morning, President Rajapaksa congratulated the Sri Lanka cricket team on their first ever Test series win in England on the previous night. The match went close to midnight on Tuesday until Sri Lanka captured the last England wicket with a ball to spare. “Congratulations to the Sri Lanka cricket team on the 1-0 series victory, Sri Lanka's first multi-Test series win in England. - MR,” the President said in a Twitter message. Several parliamentarians, including those in the UNP and the JVP, too have greeted Anjelo Mathews and his men on their historic achievement. Stubborn resistance by century maker Mooen Ali (108 not out) and James Anderson (a 55-ball duck) could not save England as they tumbled to defeat by 100 runs to give Sri Lanka their first series win in England. With match seeming to ending in a draw, paceman Shaminda Eranga bounced the fifth ball of the last over and Anderson failed to keep it down and Rangana Herath took the catch to fuel the celebrations. Had victory eluded the gritty Lankans would have been a travesty of justice. The Lankans came to England gritting their teeth to tame the British Lions and add insult to the injury inflicted by Australia in the Ashes series and that they did it was great. At one stage the Lankans were looking down the barrel with England on 311 for 3 in reply to the visitors’ first innings total of 257. But that they fought back with a brave 160 from skipper Mathews in the second innings and buried the Lions in the dust in Headingley was great.